Today when I opened Facebook, as I do every day, at some point, at least once, I was surprised to see the social network asking me for some time and input. Generally speaking, it asks “What’s on your mind?” or something similar in the status update entry field, but this was different; this was a genuine request for me to complete a survey as part of a new Facebook Feedback Panel program, and provide meaningful feedback about FB itself, and the experience of being a user. This was weird for a number of reasons: First, it hasn’t seemed all that interested in my feedback in the past, and second, it prompted me to be self-reflexive about when and why I use Facebook, and what I hope to find there. That second point is important, because it’s rare that I look inward about my social media usage habits in any forum, and Facebook has been around for so much of my digital life that it’s become almost invisible. Finally, the questions Facebook asked in its survey also reflect its own goals in doing the asking to begin with. 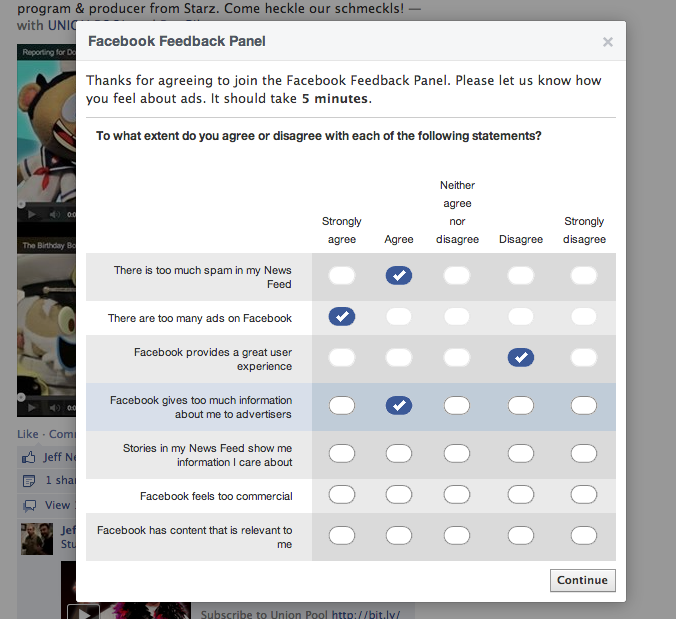 The survey covered News Feed, and how I felt about it, what it provided me as a user. It was telling that I couldn’t really cop to getting much use value out of the stories in my News Feed. When asked about why I felt like relevance was decreasing, I was struck by the fact that I don’t really feel like I ‘know’ anyone on Facebook anymore. While back when I first started using the network, it seemed a great way to stay in touch with classmates with whom I might otherwise lose contact, now it seems like a catalogue of a lot of people I probably should’ve just lost contact with but never did. And yet I still use FB quite regularly, if by ‘use’ I employ the broad definition of ‘open a tab, go to facebook.com.’ But as the survey revealed when it prompted reflection on my usage habits, that’s happening less frequently, and it’s likely tied to the decreased stream relevance. Of course, many of the social network’s recent efforts have been around reinjecting some relevance into the News Feed, by bringing in things like actual news sources, public posts and more. But the detritus of old connections still makes it a net inconsequential, or at worst, net negative experience. 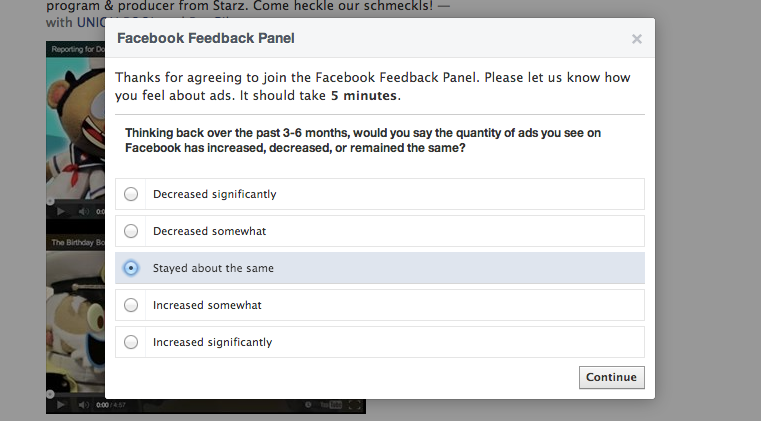 This survey also covered ads, both in the News Feed and on the site in general. The questions asked about the relevance of the ads, their general level of quality, their potential to offend and much more. Facebook is clearly aware that ads could be a contributing factor to any issues it’s having with the engagement level of individual users. And in selecting the types of statements it’s choosing to seek agreement/disagreement from users, it’s also generally aware what’s wrong with the type of advertising its platform engenders. The relevance issues I mentioned above in the first section aren’t caused by ads, but they aren’t helped by them, either. To be fair, I’m never going to tell anyone that I find any ads “Interesting” or “Helpful” – the entire concept of advertising is at odds with those descriptors in my book. But it’s still true that in general, I find Facebook’s ads particularly uninteresting, and not at all relevant, let alone helpful. 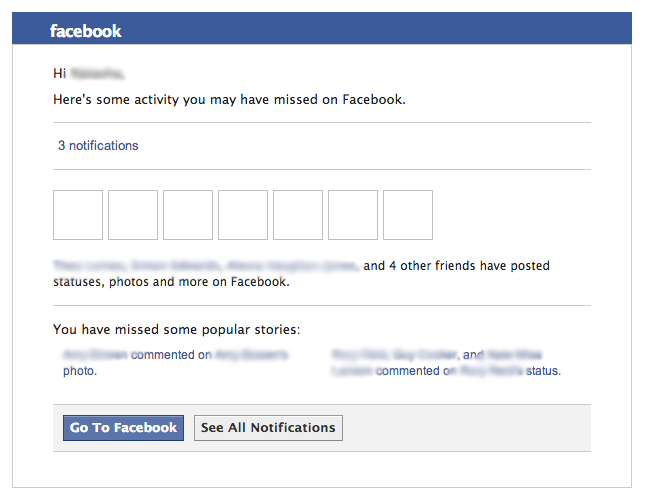 Facebook has also been sending out more emails to prompt users who haven’t been overly active to come back and play. As you can see in the screenshot below, users are receiving notices about activity in their network to try to get them to re-engage. It’s a common tactic among social startups and companies of all stripes, but combined with efforts like this Feedback Panel, it indicates a need to identify the source of an engagement problem and counteract it. The Feedback Panel is a good idea, and I applaud Facebook for doing it, since it seems like a genuine desire to give some users a way to provide meaningful input, instead of just a release valve that lets them blow off steam to little or no effect. But it’s worth noting that the program and its implementation show a company that needs to figure out the next stage of its evolution, and arrive at a plan that can help it reverse a potentially troubling trend.